Have you ever seen those super high advertising balloons attached to a pennant string and wondered how in the world they didn’t blow away? Did you ever wonder where they were grounded and stretch your neck to try and see? If so, you know how interesting cloudbusters are even from a distance! It’s that same wonder that will attract customers into your business if you invest in one. 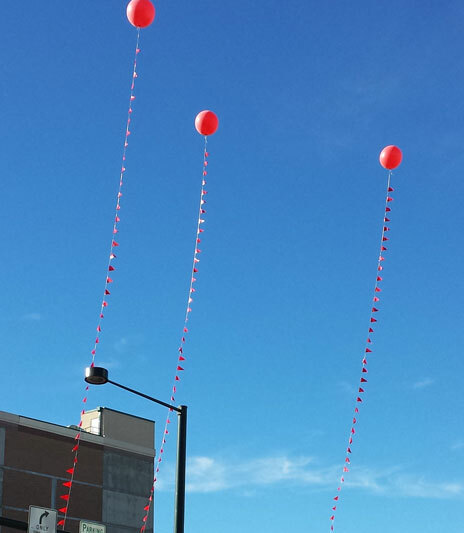 Those giant balloons get customer attention, which translates into crowds of sales for you. Cloudbusters reach nearly 100 ft. into the sky, utilizing the underused advertising space above your business. Our balloons are made with element-resistant, hearty chloroprene. The hottest summer sun won’t affect it. To get your own alluring cloud buster, give us a call today!